Join us for the 28th Annual Governor’s Surf Fishing Tournament! New Jersey Division of Fish and Wildlife, along with our co-sponsors—New Jersey Division of Parks and Forestry, New Jersey State Federation of Sportsmen’s Clubs, Jersey Coast Anglers Association, and New Jersey Beach Buggy Association—congratulate Keri Mauger of Mohonton, PA who took the grand prize and NJ Governor’s Cup by catching a 36-inch bluefish. Ms. Mauger received two-rod and reel combinations, a pair of Costa Del Mar sunglasses, a plaque and will have her name engraved on the Governor’s Cup. 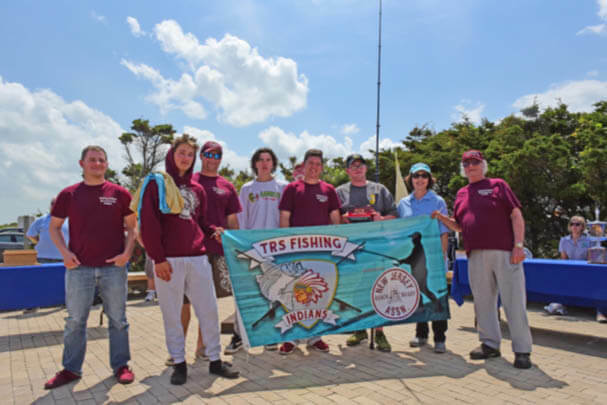 Also, congratulations to Toms River High School South for winning first place in the High School Team Category with a 35 1/2-inch bluefish. Toms River High School South had their name engraved on the new High School Team Cup and received a 1st place plaque. All participants who mailed their registration were entered into an early entry raffle for a Coastline Surf System. Mark your calendars for the 28th Annual Governor’s Surf Fishing Tournament to be held on May 19, 2019! 1st Place in the High School Team Category, Toms River High School South, with Acting Commissioner Catherine McCabe at the Governor’s Surf Fishing Tournament. Become an instructor with Fish and Wildlife’s Hunter Education Program. Our Hunter Education Unit is looking for New Jersey’s best ­sportsmen and sportswomen to become ­instructors at locations where students take the test and field course after first having completed the home study portion. A minimum of six weekend days each year are required. Leave your name and address to receive an application. Report Abuse of our Outdoor Heritage! tarnishes the image of sportsmen and robs us of our fish and wildlife as well as tax and license dollars. You can make a difference. 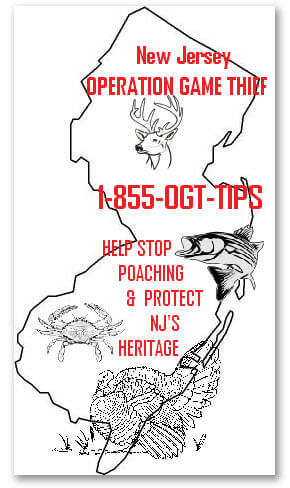 Funded by the New Jersey State Federation of Sportsmen’s Clubs. Designed to encourage sportsmen to report poaching and wildlife crimes.